Tirupati Madurai Rameshwaram Kanyakumari tour package, follows a heartfelt journey through the religious, historical and cultural hubs of South India. The itinerary reveals some of the larger-than-life architectural wonders drenched in the spirituality of the highest order and flaunting the inimitable artistic excellence. Some of the world’s most-visited and richest Hindu temples with invigorating mythological and historical tales keep the pilgrims and tourists fully fascinated during Tirupati Madurai Rameshwaram Kanyakumari tour package. Be it the Tirupati Balaji Temple, surrounded by exotic flora and fauna, or the Shiva Jyotirlinga at Rameshwaram or Meenakshi Amman Temple of Madurai, featuring spectacularly carved temple towers or gopurams, the tour keeps getting better with every fanciful attraction unveiled. 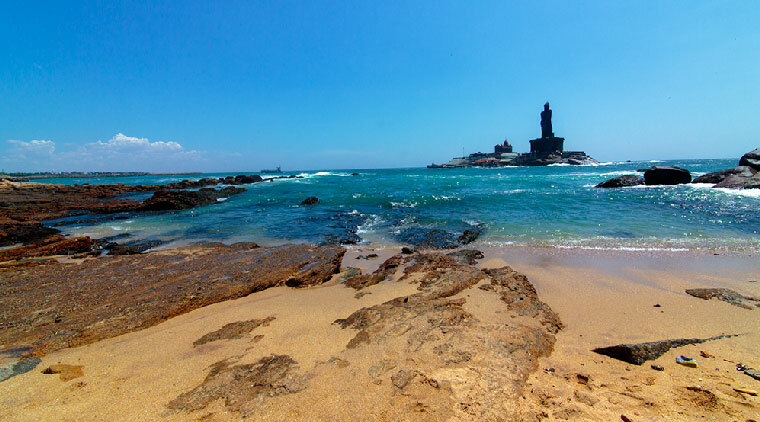 You would also have the opportunity to witness the memorable sights like the confluence of the Bay of Bengal, the Indian Ocean, and the Arabian Sea at Kanyakumari and the grand temple car processions (depending on festival schedules) at Tiruvannamalai. In short, Tirupati Madurai Rameshwaram Kanyakumari tour package is one expedition you would remember for long. Refer to the detailed itinerary of Tirupati Madurai Rameshwaram Kanyakumari tour package below and contact us to customize it with your own ideas.We would love to tailor it to suit your travel and holiday mood. The best starting point for Tirupati Madurai Rameshwaram Kanyakumari tour package is Chennai which hosts stupendous air and rail connectivity. Arrive at Chennai airport/railway station and meet our tour representative. You would start the road trip to Tirupati right away. Tirupati is home to the richest Hindu temple called Sri Venkateswara Swamy Temple (also popular as Tirupati Balaji) which is dedicated to Lord Venkateswara (or Srinivasa), an incarnation of Lord Vishnu. According to the legend, Vishnu meditated here as Srinivasa after his consort Goddess Lakshmi left him following a fight and married Princess Padmavati (believed to be an incarnation of Lakshmi only). Another popular belief is that Lord Vishnu decided to appear and stay at this place in order to save his devotees from the troubles of Kalyuga (or Kali Yuga). On arrival, check in at the booked hotel and take some rest. You would have the remaining day to be spent at leisure and you may plan to visit the attractions like Sri Venkateswara National park (open till 08:00 p.m.; entry fee INR 5/2 for adult/child), Sri Venkateswara Zoological Park (open till 05:00 p.m.; closed on Tuesday; entry fee INR 20/10 for adult/child; camera fee INR 100/20 for video/still; safari fee INR 25/10 for adult/child) and the natural arch called Silathoranam. Stay overnight at Tirupati. Get up early in the morning to have darshan at Tirupati Balaji Temple (opens at 02:30 a.m.; special entry costs INR 300 per person). Admire the stunning Dravidian Architecture of the temple which is located on one of the seven sacred hills of Tirumala. Later, begin the journey towards Tiruvannamalai, an important stopover on almost every Chennai Tirupati Rameshwaram tour. 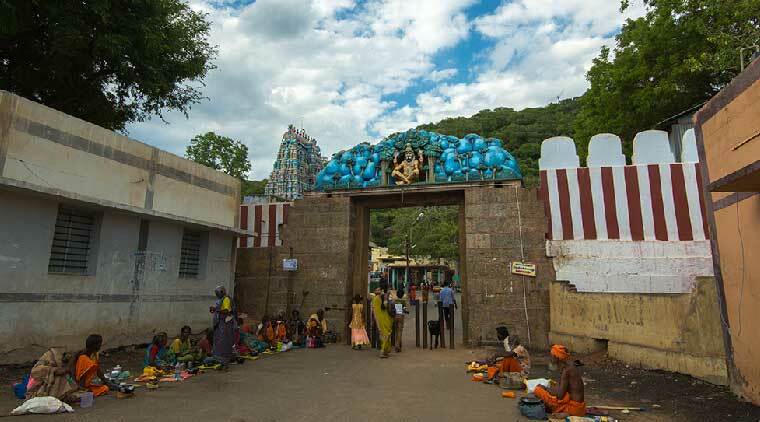 The town is famous for Annamalaiyar Temple which is one of the Pancha Bhoota Stalas (five temples representing Lord Shiva as the five elements of life) as it represent Shiva as the element Agni (fire). According to the legend, the entire universe was deprived of light when Goddess Parvati playfully covered the eyes of Lord Shiva just for a moment. To restore light, Shiva emerged as a pillar of fire on the top of Anamalai Hills which is located in the backdrop of the temple. On arrival, check in at the booked hotel and relax. If time allows, you may visit the popular attractions like Jain Temple Complex, Sathanur Dam, Ramana Ashram and Annamalai Hill on your own. Stay overnight at Tiruvannamalai. Visit the main temple (opens 05:00 a.m. -12:30 p.m. and 03:30 p.m.-09:30 p.m.) and have darshan of Shiva Lingam. 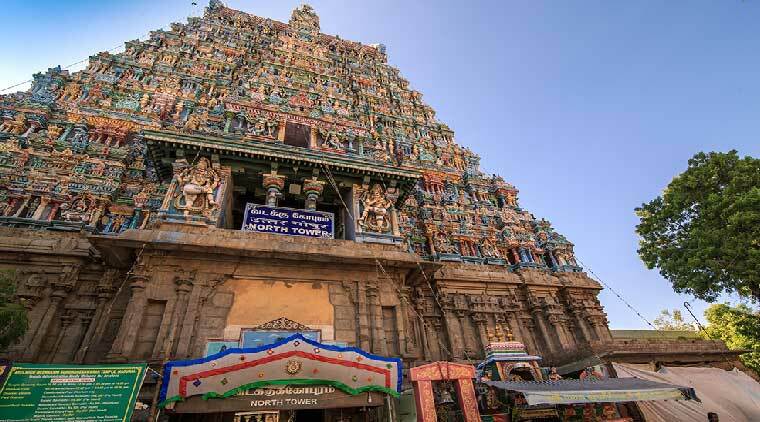 The temple which boasts of sky-reaching gopurams (gateway towers) and captivatingly carved pillars is also renowned for hosting many enchanting festive celebrations like Karthigai Deepam (in December). Begin the road trip to Madurai, the city built around the colossal Meenakshi Amman Temple which is no less than an icon of Tamil Culture. Popularly called the ‘City that Never Sleeps’, Madurai attracts millions of tourists every year to its mesmerizing temple architecture and numerous festive celebrations hosted round the year. On arrival, check in at the booked hotel and stay overnight. Start the fourth day of Tirupati Madurai Rameshwaram Kanyakumari tour package with a visit to Meenakshi Amman temple which is dedicated to Goddess Meenakshi (a form of Goddess Parvati) and her consort Lord Sundareswarar (a form of Lord Shiva). The legend behind the place states that Parvati was born out of the sacred fire of a Yagna (sacrifice) performed by the local king and was named Tadaatagai and Meenakshi. After conquering the entire universe, the Goddess found true love in the form of Lord Shiva who married her taking the form of Sundareswarar. Destructed by the Muslim invaders, the temple stands in full glory as an epitome of unparalleled architectural excellence. As many as 14 gopurams with such fascinating carvings provide exceptional visual treat to eyes. Visit the temple (opens 05:00 a.m.-12:30 p.m. and 04:00 p.m.-10:00 p.m.; entry fee INR 50 for foreigners and INR 50 for phone cameras), pray to the Goddess and explore the stunning architectural wonders like gopurams and Hall of Thousand Pillars. 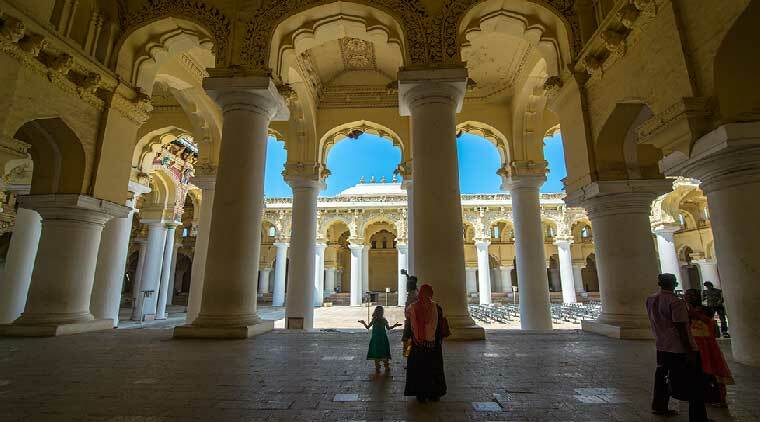 Later, you may visit other popular places like Koodal Azhagar Temple, Alagar temple, Gandhi Museum (opens till 06:00 p.m.; entry free; camera fee INR 50) and Thirumalai Nayak Palace (opens till 05:00 p.m.; entry fee INR 10/5 for adults/children). Stay overnight at Madurai. Begin the road trip to Rameshwaram, the holy town located on an island called Pamban and home to Ramanathaswamy Temple which houses one of the 12 Jyotirlingas of Lord Shiva. Have a fabulous ride over Pamban Sea Bridge and check in at the booked hotel on arrival. Rameshwaram is the place where Lord Rama worshipped Lord Shiva to get rid of the sin of killing the demon king Ravana who was a Brahmin by birth. Dotted with many religious sites dating back to Ramayana, the island is also popular for calm beaches. Visit Rameshwaram Temple (opens 05:00 a.m. to 01:00 p.m. and 03:00-09:00 p.m., puja may cost around INR 500-600) and pray to the Shiva Lingam. The temple features the world’s longest Hindu temple corridor adorned with enthralling art and sculptures. You may take holy bath in the sea (called Agni Teertham) near the temple and at other 22 holy water bodies (in the form of wells and tanks called teerthams). Later, explore other famous places like Panchmukhi Hanuman Temple, Gandhamadhana Hill (believed to have footprints of Rama), Rama Setu (Adam’s Bridge), Dhanushkodi and Ariyaman Beach. Stay overnight at Rameshwaram. Today, you would visit the final destination of the package tour from Chennai to Tirupati Rameshwaram Kanyakumari – the coastal town of Kanyakumari which is believed to be the southernmost tip of mainland India. According to the popular legend, Goddess Shakti or Devi Bhagvathy killed demon Bana and decided to stay here as the virgin girl (kumara kanya) forever. On arrival, check in at the booked hotel and later visit the top tourist places. Start with Kanya Kumari Temple (opens 05:00 a.m. to 12:30 p.m. and 04:30 p.m. to 08:30 p.m., puja costs range between INR 4-200). Then, visit other attractions like Vivekananda Rock Memorial (opens 08:00 a.m.-04:00 p.m.; ferry fee INR 20; entry fee INR 10), Our Lady of Ransom Church and Thiruvalluvar Statue (opens 09:00 a.m.-04:00 p.m.). In the evening, enjoy stunning sunset views over the beautiful confluence of Bay of Bengal, Indian Ocean and Arabian Sea. 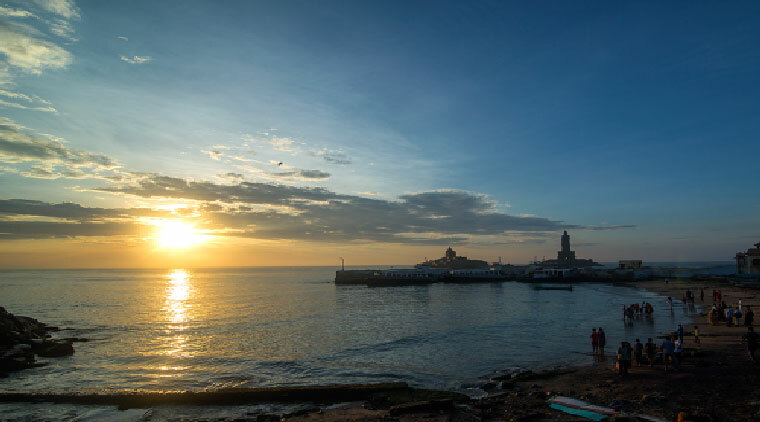 Stay overnight at Kanyakumari. 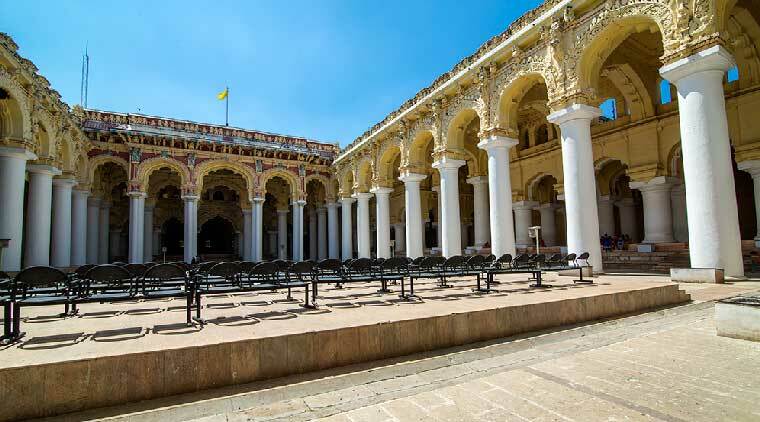 Start the road trip to Trivandrum (or Thiruvananthapuram), the capital of Kerala. On arrival, visit Padmanabhaswamy Temple (opens 03:30 a.m.-12:00 noon and 05:00-07:20 p.m., INR 10-150 for special darshan). The legend states that Lord Vishnu appeared as a divine child in front of Sage Divakara at this place. Finally, transfer to the airport or railway station to board the scheduled flight or train back to home. The Tirupati Madurai Rameshwaram Kanyakumari tour package ends here.